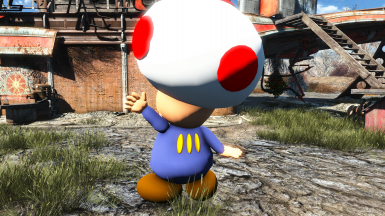 I would like to thank Nintendo for bringing us Toad. Once again there are no Nintendo assets used in this mod. Here is a size comparison (he is a bit large, but I figured this works well for a statue). The Armor was just released a few minutes ago called "TERA Kyna Armor" for those wondering, it is marked NSFW if you can't see it and have those mods blocked. He is wearing his own Vault 111 Suit... BECAUSE IMMERSIVE REASONS!!! I hope that you get never ending nightmares some enjoyment out of this... I know that I did, and still do. Please List any requests that you might have in the comments and I will try to get them done, do note though that it does take a lot of work for just one of these using Pool Balls and Outfit Studio only... so unless I get really bored for several days in a row don't expect them very quickly. thank heavens for people doing positive thing when they get bored . This beats everything. My 6 year old daughter saw it. I will never be able to uninstall. You, and your 6 year old daughter are very welcome. Make sure to put them right outside of Setters windows at night staring into the room... it's great. And then collectible figures like bobbleheads. Dude im done, i am seriously done here.. that idea is epic as hell, just 2 problems. 1st. most important problem... there's only 1 guy doing all this, i have faith in his skills but may take him sometime, but this is a mod that requires to be a full on full package download.. i mean all character's at once as those Shrinked bobble heads... right? 2nd. with my knowledge of mario being limited as i said previously that i have never played any nintendo game, i was a Sega player then playstation then PC, so sorry..*epic music starts to play low* but this is absolutely vital that we go old school *epic music volume raising higher and higher*so far back to the start for the final 10th piece... wait for it.. YES....HIM.... *epic music is so loud it's above all noises that could ever exist at any given time* .......*epic music stops..dead* DONKEY KONG THE APE has to be in this line up! the game started with just him and Mario on a stupid platform game jumping barrels or am i wrong? *claps and cheers..... standing ovation occurs* now i sit.. limp, tired from the epicness i just witnessed. Nah he can do it, look at what he's done already and tell me he can't do more of the same, the things he needs are time, will and focus. Most mods are done by a single person. This is not a problem at all, I wouldn't be supprised if he is already working on it. I suggested this on purpose once he creates the figures making shrinked statues or bobblehead's will be a piece of cake. @ Maciek1010: I like your enthusiasm and believe in my modding abilities given time, will, and focus. I will admit the "will" part took a hit when I came back after work today and noticed that it got 0 Endorsements the entire day after getting 6 initially. I haven't been working on it... yet. This is a "boredom" mod project so when I don't have conversions to make, or I get bored and just wanna mod something one day, then I know where to turn to. You are right it will be very easy to shrink them down into Bobblehead-esque collectibles after I make the initial model. Once I have a nice collection of them I will Bobblehead them all and release that as a separate mod, and I really like that idea... and had it myself while making this. @Maciek.. i do have faith in his skills, he's currently teaching me stuff. I know there a lot of single modders that get a lot done but they do in fact take time which is what i was pointing towards not his skills or him being alone just the fact that it will take him time, shame my knowledge wasn't larger right now i would try to help. sorry Derps! Yes boredom into a project... cool!! You're both right, It is sad, my first impression was Hot Files guaranteed. 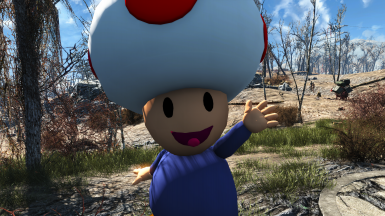 Maybe they don't know Toad? Or any Ninny game in general. After all Nexus is very PC oriented and I believe only a hand-full of people know anything about consoles. Did I mention that when you get the BB's done you already have a stand for them? You mean the in game Bobblehead Stand?... or is there a different one that I don't know of? I didn't expect Hot Files... but I did expect there to not be a 48+ hour delay randomly on Endorsements after the first 6... that is strange and uncharacteristic of any mods with initial Endorsements. Oh well... who knows? We will have to have a battle and see which Pool Ball Nintendo Character can get the most Endorsements... you know once I get around to making the next one. Maybe I can teach Adipsycho how to make them? Would be good practice for those Outfit Studio skillz. Yes please teach me as much as you have freetime, i am pretty much always free the only problem we really have is the time zone is not really on our side but easily countered. but yes i will/would help if i knew how to manipulate stuff like you are doing. I meant I'll help you make a new one. When you're done with all the figures pm me. @Adipsycho: Alright, but it honestly isn't very different from what I have already shown you... with a twist. You mostly just need to take full advantage of the tools given on an initially small spherical object. Like molding lumps of Play-Doh (or Plasticine) in Outfit Studio. @Maciek1010: Sweet, sounds good. You will be seeing the figures intermittently popping up on this site from time to time (I will release them individually). Yoshi is probably next, since Toadette is just a lazy redo of this figure. But... what about everybody's favorite waifu? This will be challenging indeed... and require a great deal of Pool Balls. I will try for sure, but if it ends up not meeting my Waluigi Waifu standards I probably wont release it. First lets get Nintendo to include him in Super Smash Brothers Ultimate! I know I will make him wearing his own SSB Vault Suit in protest! bwhahahah!!! omfg.... Female version or riot!! Why do you keep saying "Female Version"? Her name is Toadette. You know this was my first post here... right? OKAY just checking. 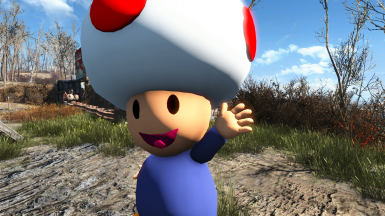 Yes Toadette and Toad shall be reunited promptly.. or when you do it. time to close down the nexus. 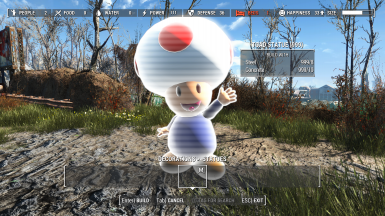 no better mod will ever be made. fallout 4 is finished. lol.... my life would be complete if he does a Female version and a bright Pink Yoshie.
! I agree, then I could concentrate on Skyrim SE mods... and destroying that game with my unique brand of crazy. @Adipsycho: You want Toadette and Pink Joshi? Don't tempt me, because I might just do it... and we really don't need more of this! 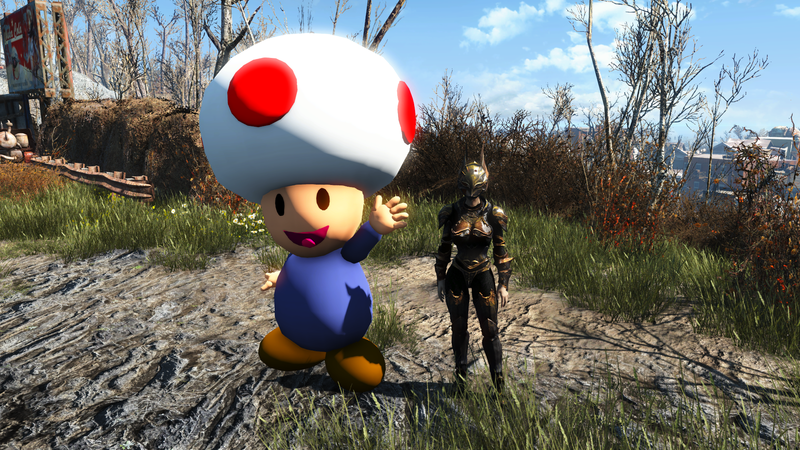 Toad is not silly! He is so super cereal in his Vault 111 Suit... and AK-47 (only when you have your back turned). He will keep your settlements safe from Deathclaws... and sleeping because obviously none of that will happen if this in in your Settlement. Ak-47? My Toad would use the Prydwen Melee weapon! A good option as well! Am I gonna have to make a post for requests? Awesome! 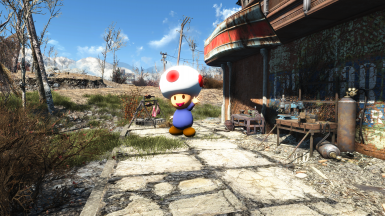 I love to see a little bit of Nintendo in Fallout 4! Nintendo stuff is pretty much what I like best, outside of TES/Fallout. Growing up with a Super Nintendo primarily and having every single Nintendo Console after that... I am a HUGE Nintendo fan. I am happy to provide some much needed Nintendo goodies to Fallout 4 (made from Pool Balls). See also Painting Portals for some Super Mario 64 esque nostalgia.